Hey there We R fans, Nancy here to day with a look at the new Tag Punch Board. I always have a hard time getting the slopes on my tags to match, so this tool really comes in handy! Today I’m going to make a bed of layered cards for a card base. 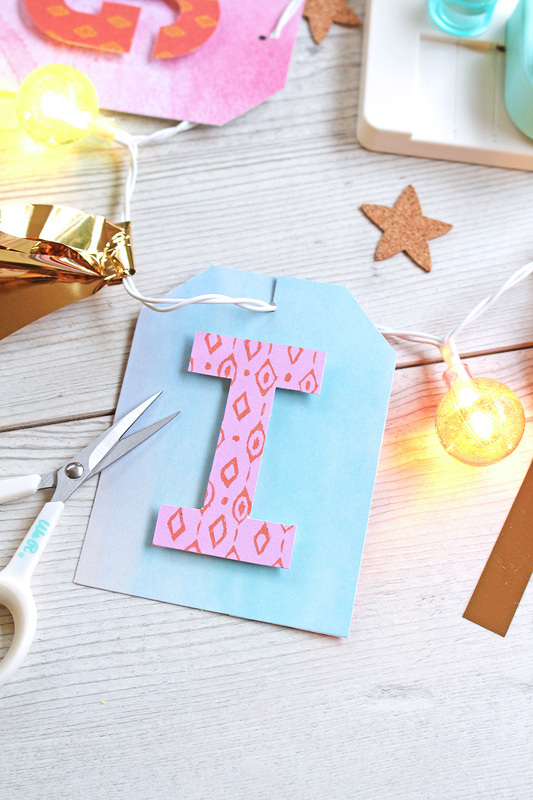 To create the tags, I chose gold, salmon and white cardstock in three different widths. 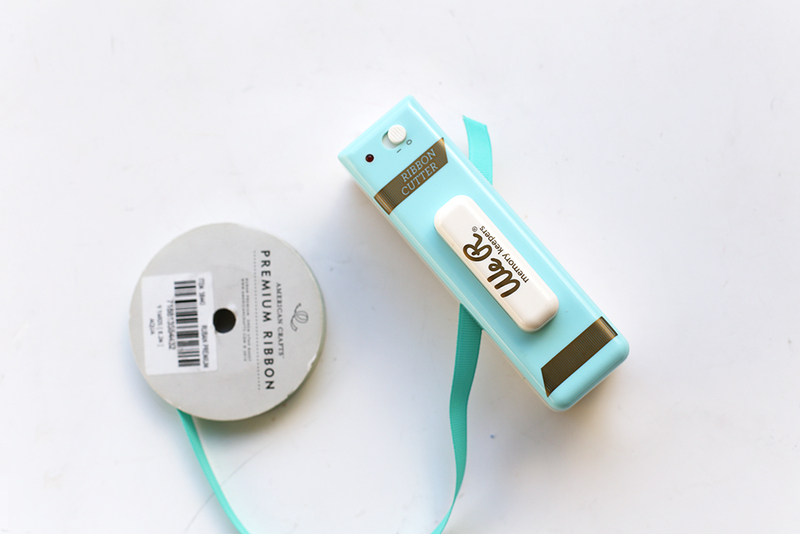 Using the Tag Punch Board is as easy as lining the top of the tag and using the blade just like a regular trimmer. Flip the tag over, repeat the trim and you have a perfectly even tag every single time. It even includes a small hole punch tool for the top of the tags. I made about a dozen tags in a few minutes. 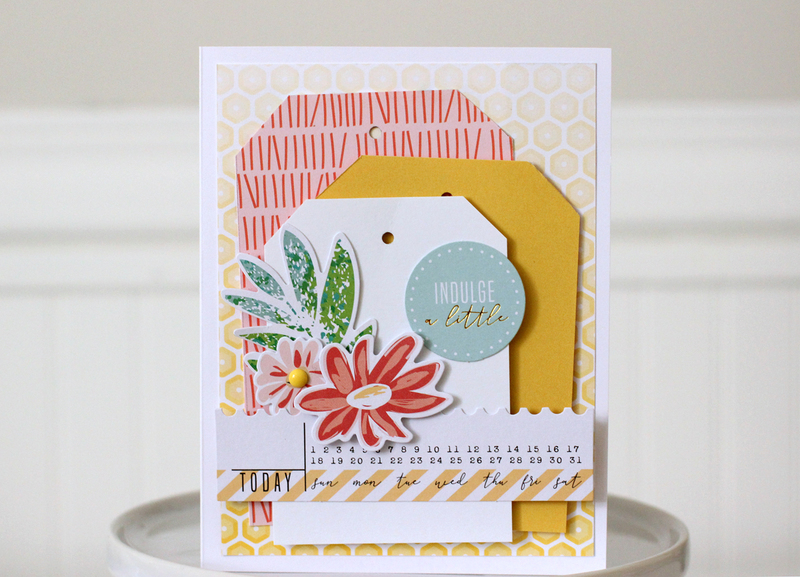 The background of the card is a very pale yellow ombre pattern. Then the three tags were layered with foam tape in a cascade. This creates a nice backdrop full of texture and color. 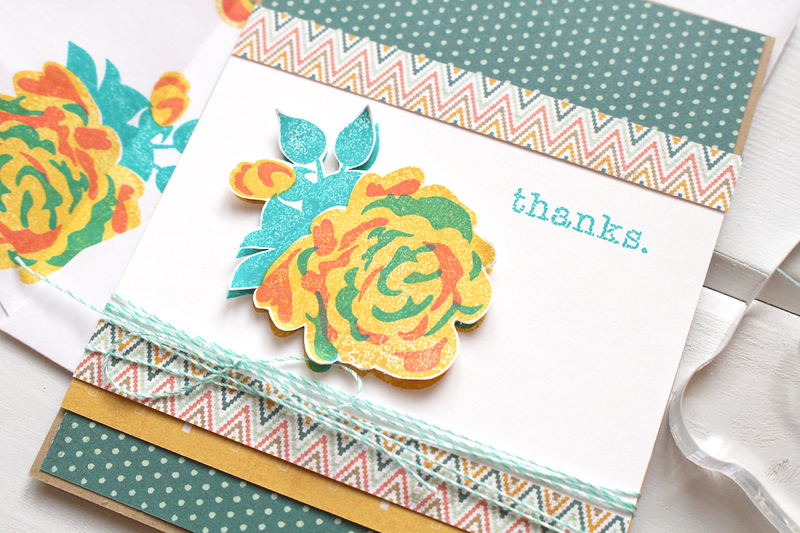 Next a variety of flower, border and sentiment die cuts were used to finish off the card. 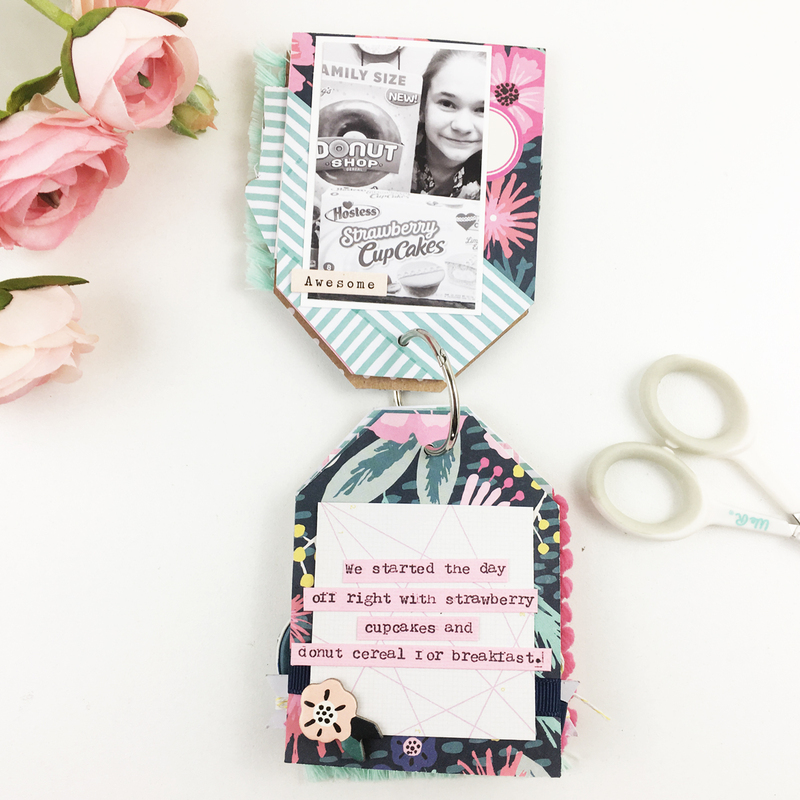 The Tag Punch Board makes for quick, simple and perfectly beautiful tags every time! Hey there, We R Memory Keepers friends and fans, Becki here, to share a mini album that I made with the Tag Punch Board. I have been looking forward to playing with the Tag Punch board since I first heard about it. 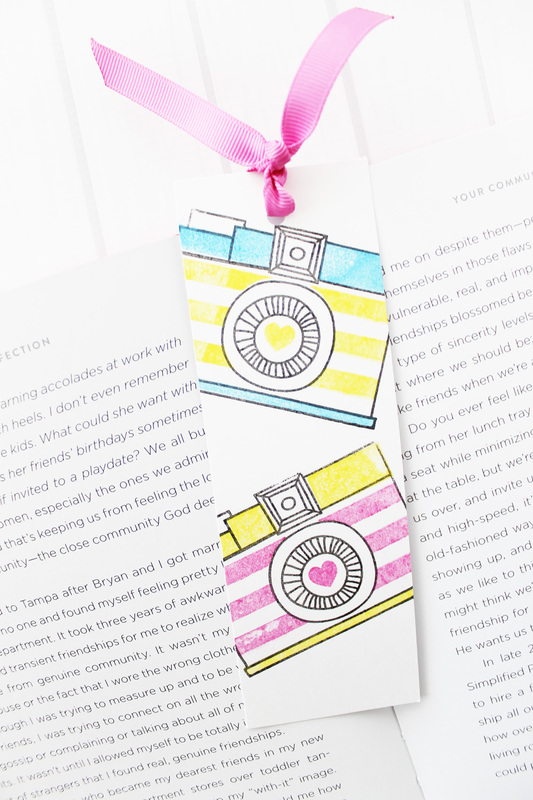 I LOVE tags and have been using them in my scrapbooking for years. Naturally, I fell in love with the tag punch board because I can create my own tags to fit my own projects. 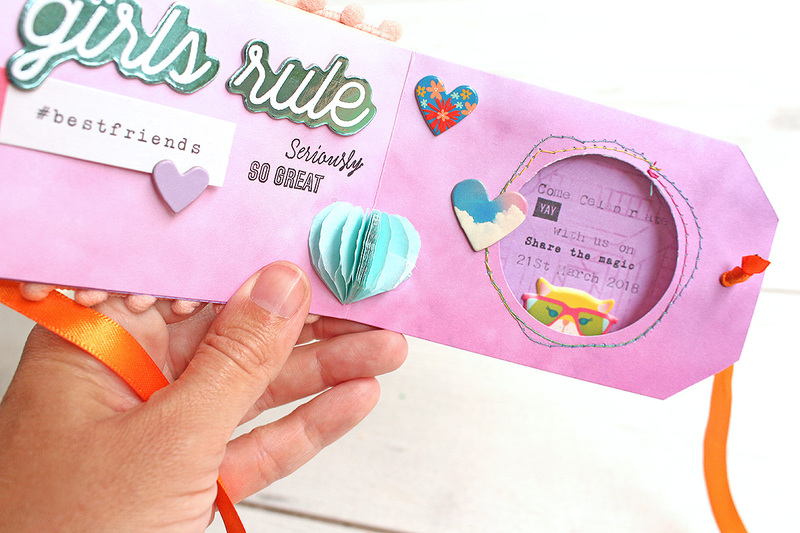 This mini album came together quickly and easily with the tag punch board. There are 5 tag pages in this album. Each page has one photo and a little bit of journaling. 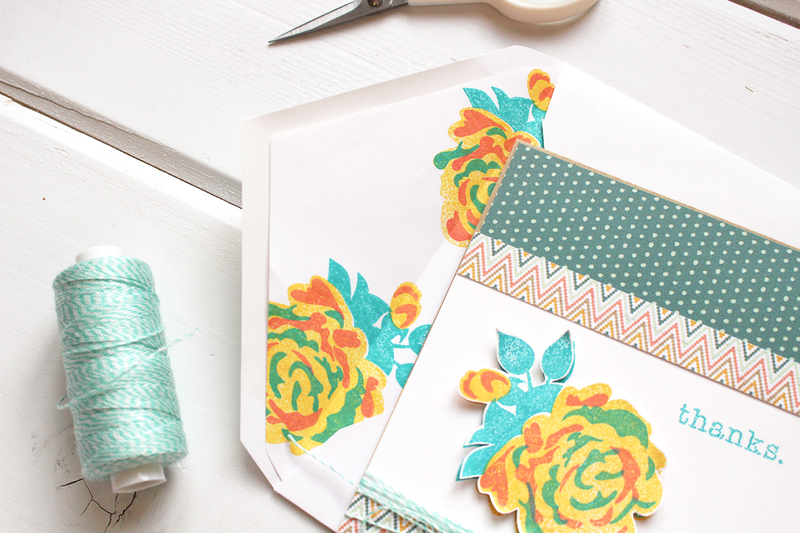 To create each page, I cut pieces of 3×4 patterned papers from the “Good Vibes” collection from Crate Paper. When I had all the pages for the album cut to 3×4, I made them into tags with the tag punch board. 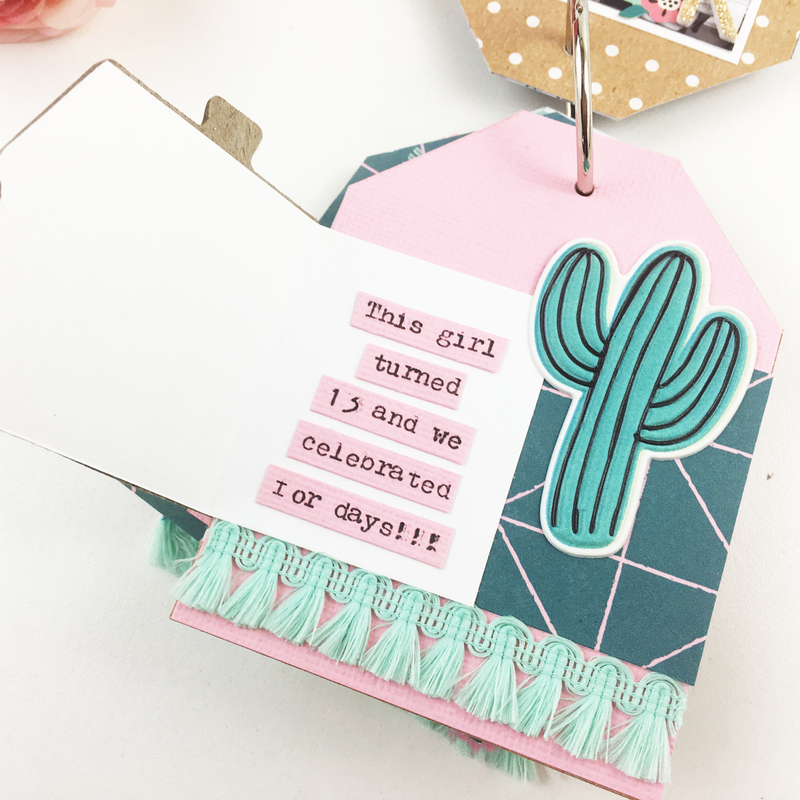 It’s so easy to make tags with this punch board. All you have to do is make two small cuts and punch a hole. It’s that easy! The album is held together with a small metal ring. This album has a lot of texture. I used a lot of pompom trim, ribbon, puffy stickers, fringe, and chipboard. Like so many of my mini albums, I added journling using my We R Memory Keepers Typecast Typewriter. I love using my typewriter for journaling on mini albums because I can fit more journaling into a small space. 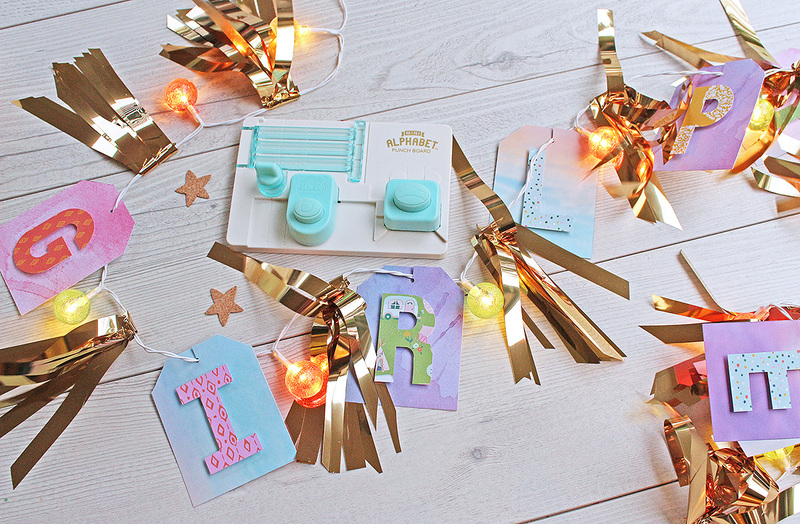 I had so much fun creating this little mini album with the tag punch board. What are you creating with the Tag Punch board? I’d love to see what you’re creating! Thank you for stopping by the We R Memory Keepers blog. I’ll see you again soon! Hello WeR fans and welcome back to the blog today! 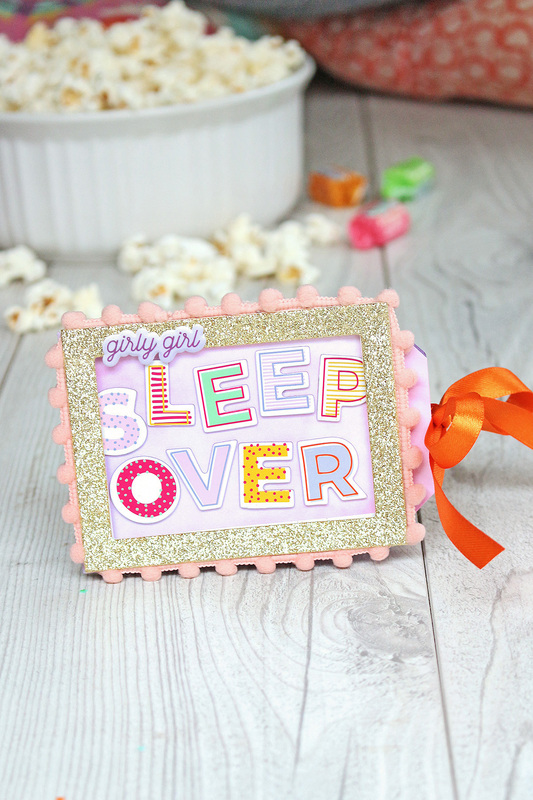 Chantalle with you again and I’d love to share this ‘girl powered’ sleepover invitation and banner I created with the new Tag Punch Board with you all. 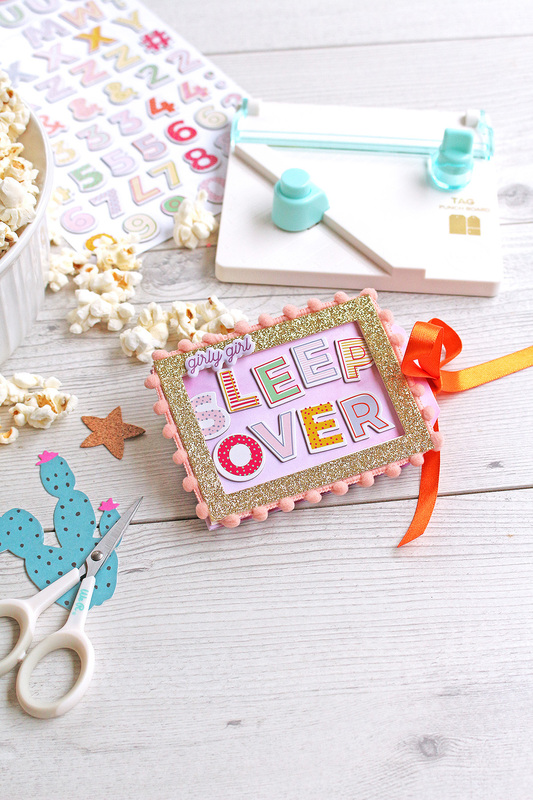 I’ve used a drool-worthy Crate Good Vibes glittery pompom frame as the main embellishment on the front. I love the bright pops of colour mixed with the softer pastel shades. Good Vibes and Pink Paislee’s Wild Child were a great mix for this project. 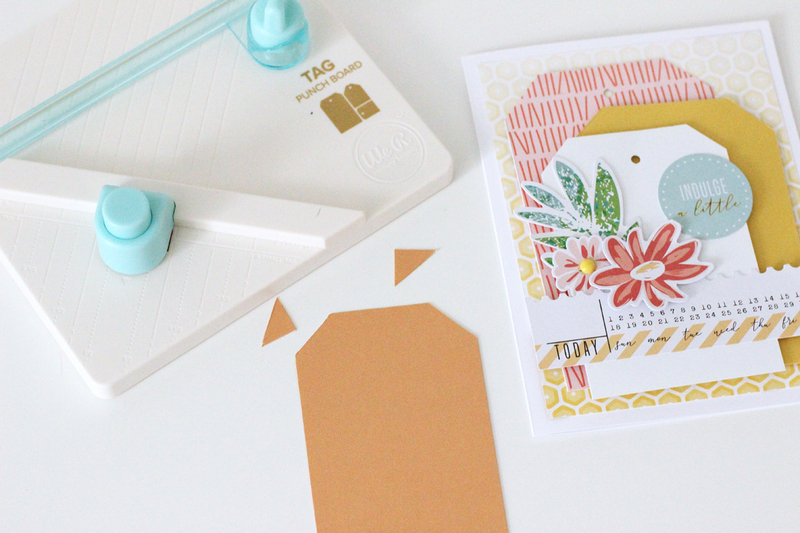 These gorgeous mismatched chipboard alphas are from Paige Evans ‘Oh My Heart’ collection. 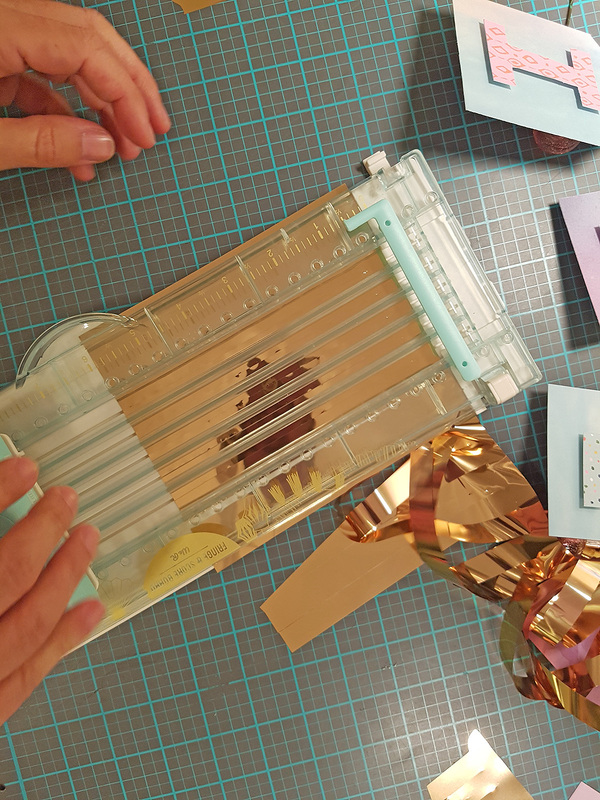 The invitation consists of four large combined tags, which were created by folding a length of paper in quarters and then trimming the tops and punching, using the Tag Punch Board. Inside, there is a circular window area where you can view information that one folds out to reveal. 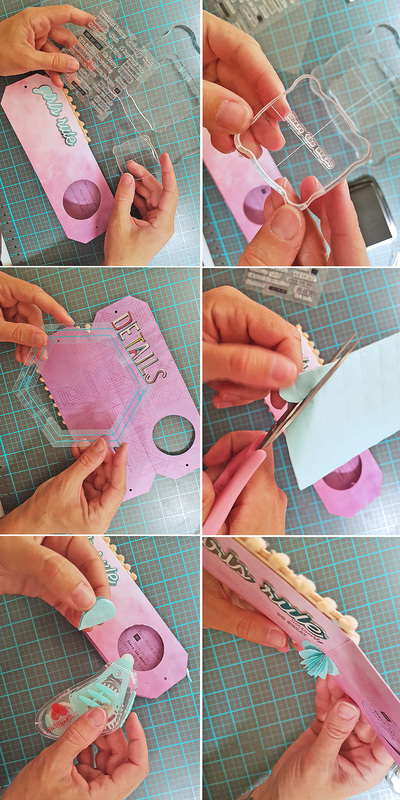 Below, you can see step by steps of how the invite came together. I started out by trimming a sheet of Pink Paislee ‘Summer Lights’ patterned paper to 9 x 6 (h) inches using my Trim & Score Board. I then scored it half way down and again at half way across. I folded it so that it was a long, 9×3 ‘strip’ and then trimmed the tag shape using the Tag Punch Board at marking ‘E’ with the blade provided. I repeated this on the opposite side as well, then punching each end so I could run some ribbon for a closure later on. Next, I opened strip up and on the lower half, punched a circular shape using one of my favourite tools, my Circle Clear Cut Punch. Folding the paper over, you can see how the punched circle creates a little window where I could put some teaser info. 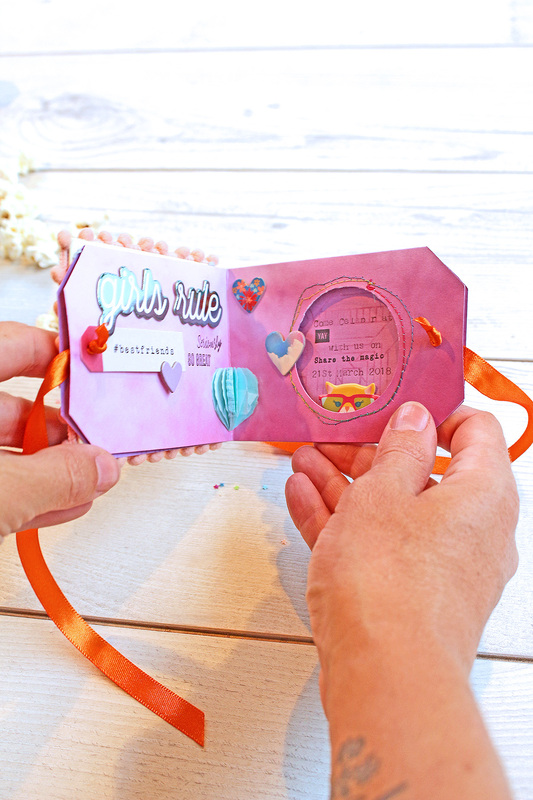 For a bit of dimension and fun, I’ve snipped a heart shape out of some Honeycomb paper and placed it in the fold, so when you open the invite, the heart opens up. I opened tag tag shape right up and popped it into my Typecast Typewriter to fill in some info. (My ribbon was a bit dry so forgive the first randomly spaced word, lol. I replaced the ribbon and all was well!) The text needs to show through the punched circle, so make sure you type on the correct side. TIP: I drew some very light pencil lines to guide my typing so I knew where it would be within the shape. 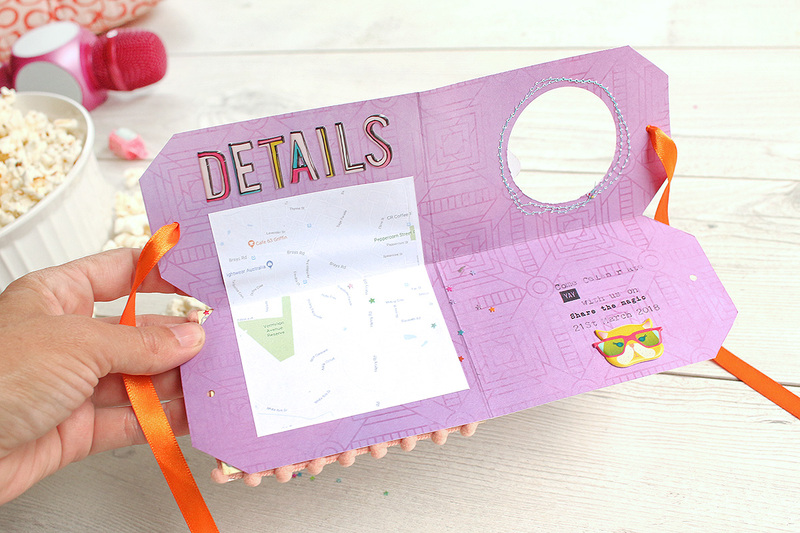 I’ve included a map in this invite, but you could also pop in some photos, a shaker element or maybe even the lyrics to your kiddo’s favourite song! I’ve also created a little banner, which can be hung in the lounge or bedroom on the night. 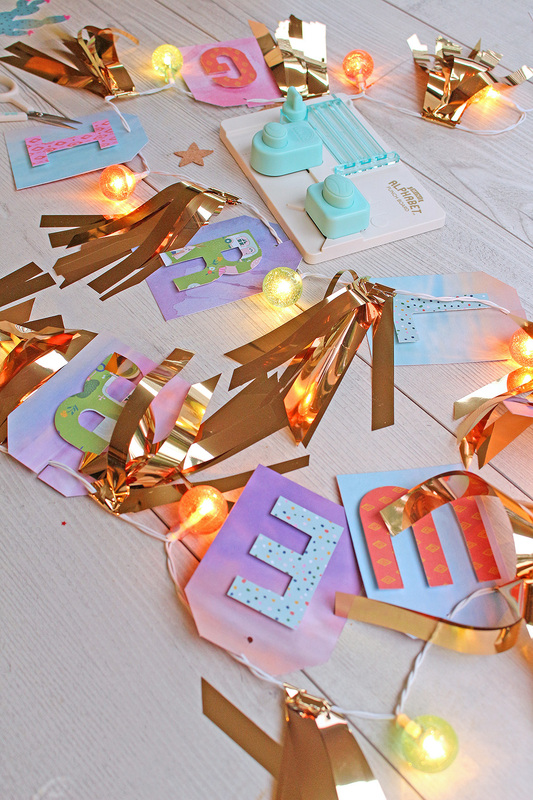 The banner also uses tags cut with the Tag Punch Board, which have been strung onto a DIY Party Light Strand. I mixed up my bulb covers and used green, pink and gold. These light strands are so versatile. I’ve used them over and over again for various projects. 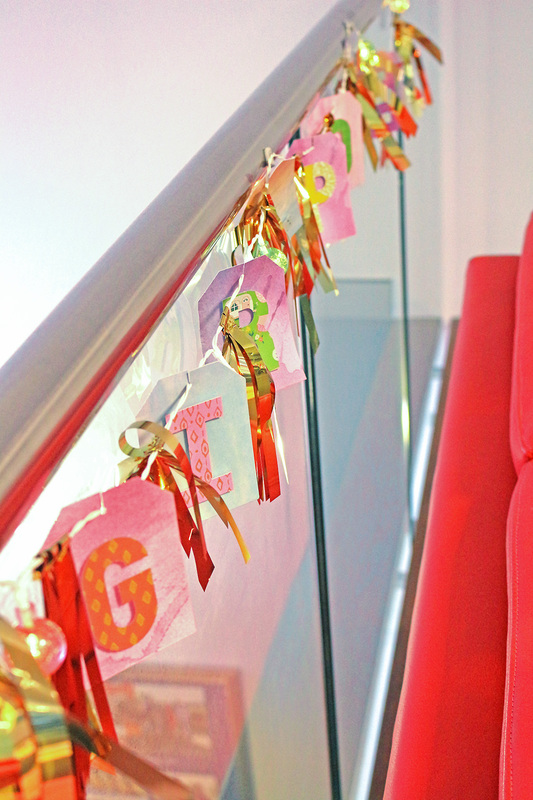 To create the banner, I created 9 tags using my Tag Punch Board, each 3×4 size. I trimmed into shape and punched a little hole at the top, making a teeny slit near the top between the punched hole and the top of the tag. 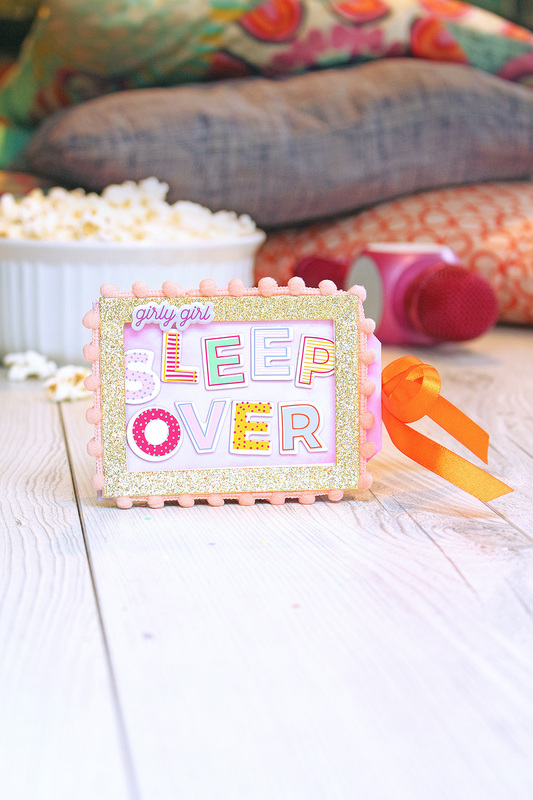 Next, I created some lettering, spelling out the words ‘GIRL POWER’ using my Mini Alphabet Punch Board. I’ve continued with the brights/pastel mix and used my Dear Lizzy Star Gazer 6×6 Pad for the letters. The finishing touch on the banner was a bit of sparkle in the form of some shimmering gold Mylar. I used my Fringe & Score Board to trim sections, which I then cut in half and attached to my banner, in between the letter cards and glittery globes. By cutting the little slit, you can easily just pop the card on to the light strand. I used my new super sharp Crafters Essentials Fine Precision Scissors. So lightweight and amazing for fine detail work! I hope you enjoyed this post. 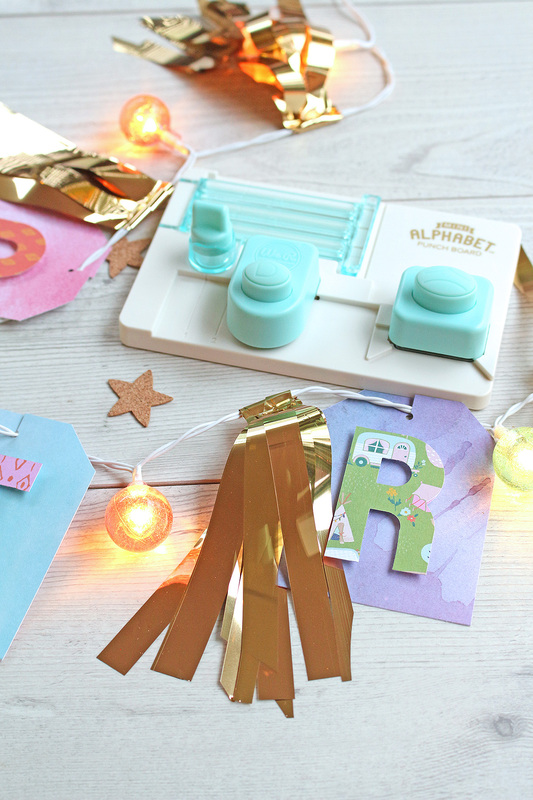 Experimenting with your Tag Punch Board is heaps of fun! Happy crafting! Hello, and happy Friday friends! Since our March new releases are only a couple of weeks away from shipping to retailers, we thought we’d remind you of what you’ve got to look forward to next month! 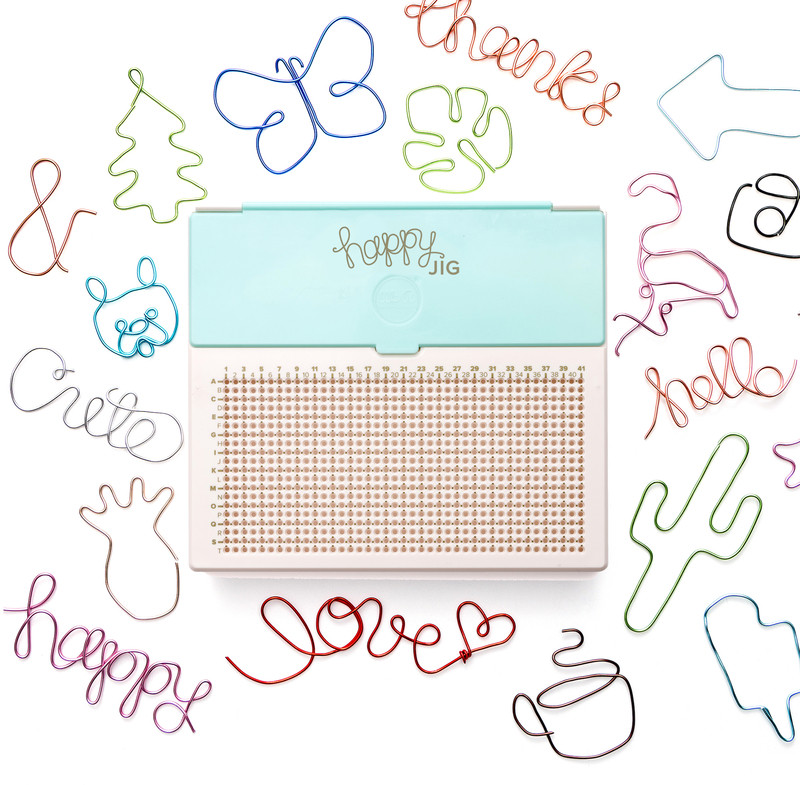 Easily bend wire into words, shapes, letters and numbers! Create custom designs by bending wire with the locking peg system. The 100 piece kit includes colored wire, pegs, and wire cutters. 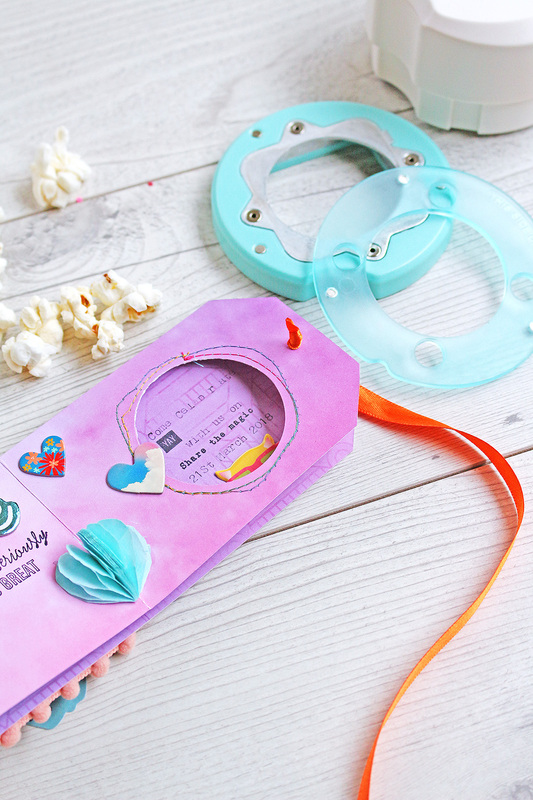 The Happy Jig includes a storage compartment for supplies, and it comes with a step-by-step instruction booklet for tons of different designs. Additional wire colors are sold individually and in a pack. For project ideas, instructions and videos, follow our Happy Jig Instagram account: @werhappyjig. 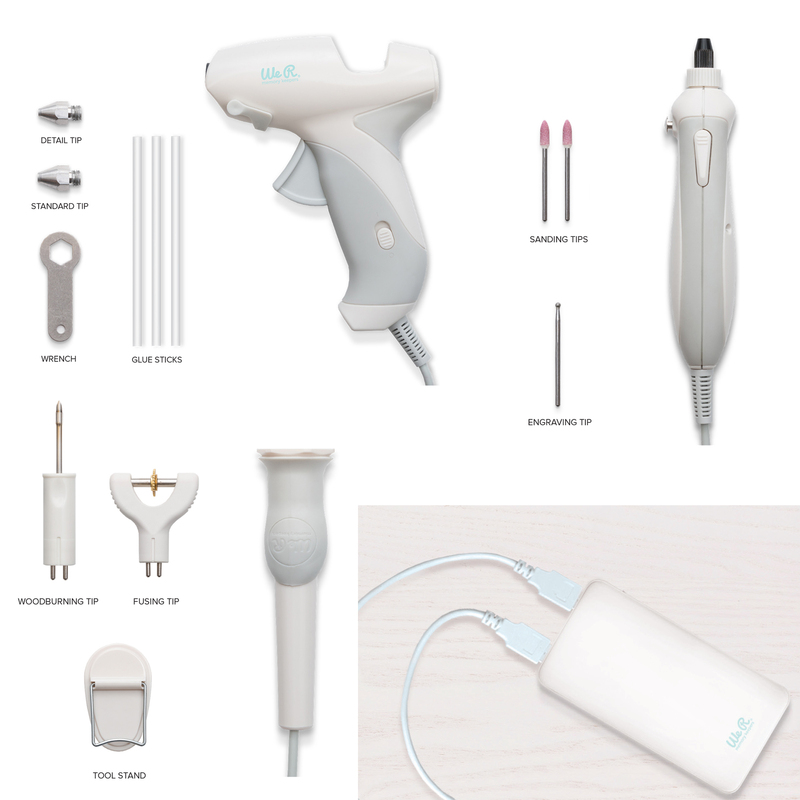 Craft on the go with the new USB Power Tools! 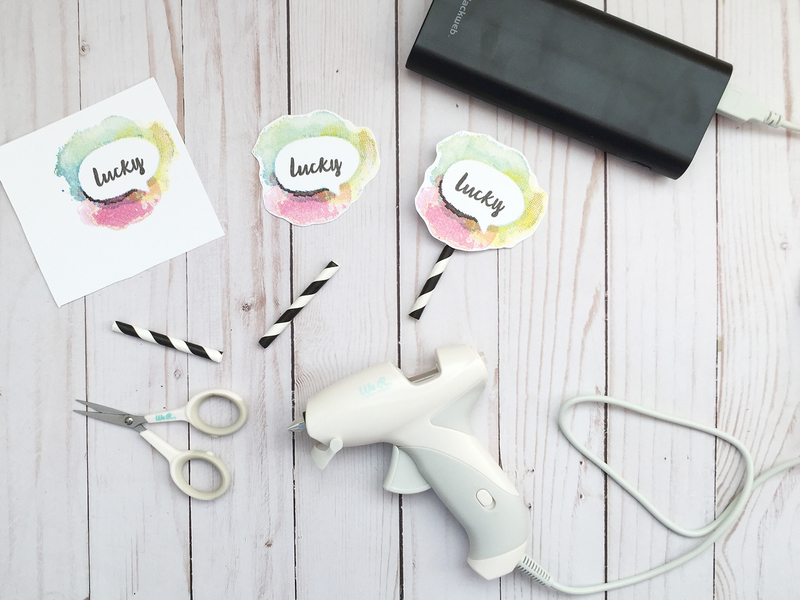 The Mini Glue Gun is perfect for small projects or quick repairs. It has a comfort grip and flip out stand for convenient use. Switch between standard and detail tips using the included wrench. The kit includes three mini size glue sticks. 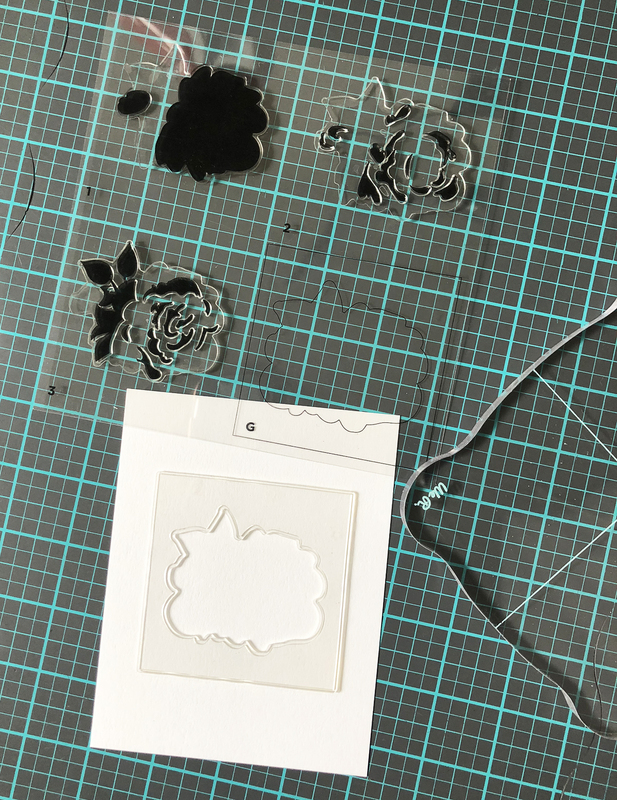 Make your crafts stand out by engraving or sanding surfaces from plastic, to paper, to wood. 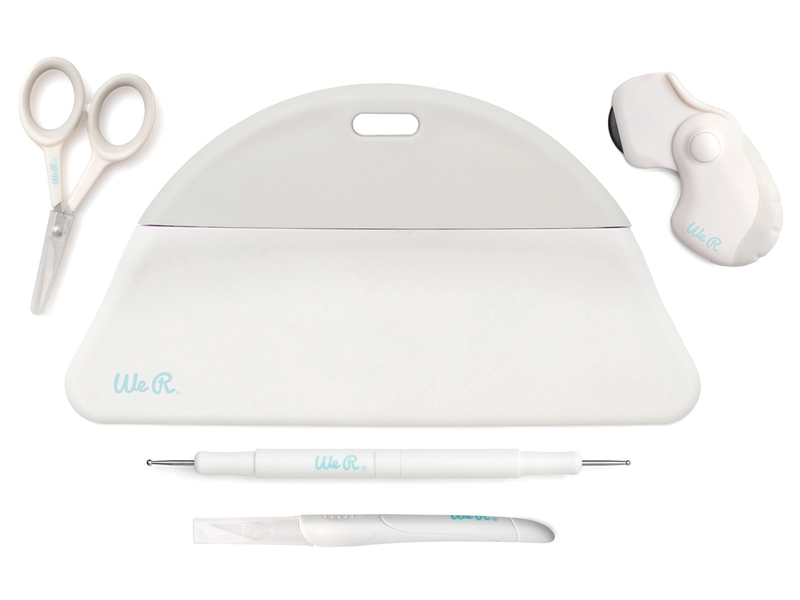 The streamlined design is perfect for crafters. Engrave and deboss chipboard, plastic, and wood with the engraving tip. Create distressed effects on paper using the sanding tips. Easily customize albums, cards, layouts and more. Use the FUSE tip to seal plastic and create customized page protector layouts and shaker pockets. Create simple designs on wood using the woodburning tip. Switch tips easily; no tools needed. You’ll love their simple and clean aesthetic, and their quality contruction and design. 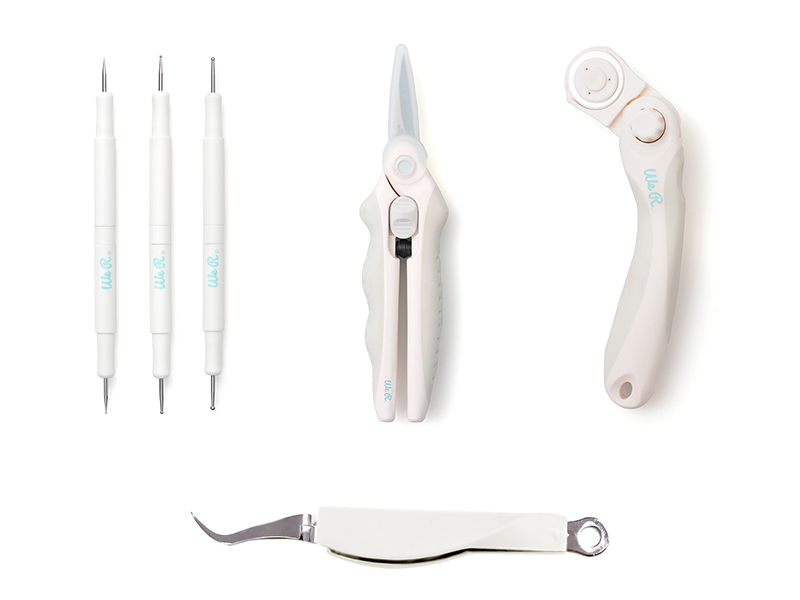 The collection includes detail, precision, and spring scissors. It also includes rotary cutters, craft knives, stylus tools, tweezers and a large bone folder. Replacement blades sold separately. You asked, and we delivered! 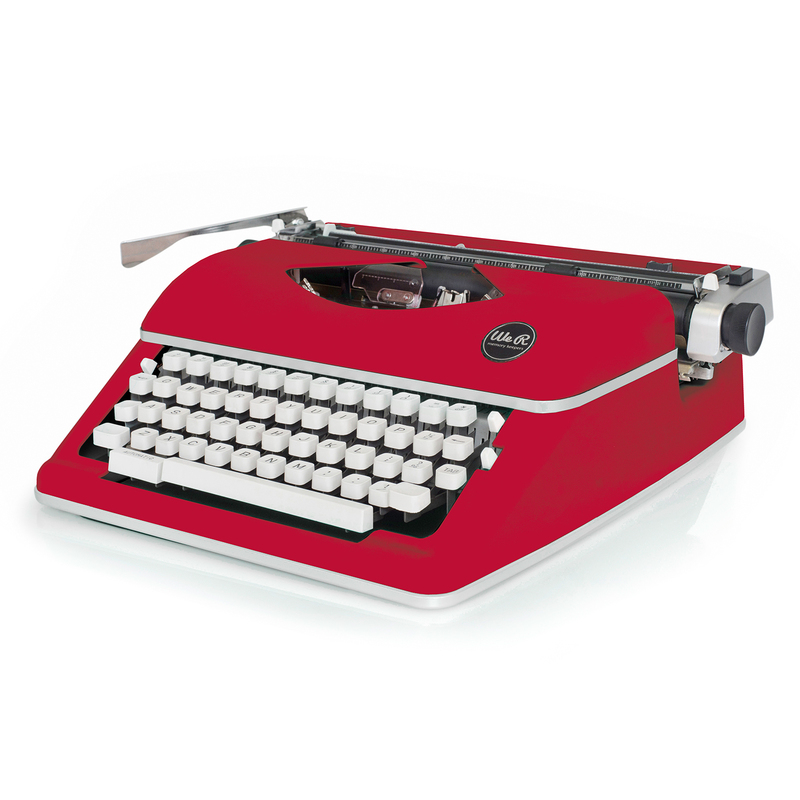 Our beautiful, retro modern Typecast typewriter comes in Blush Pink, Mint, White, Black and now Red! Easily add details, sentiments, and journaling to your cards, scrapbooks, planners, gift tags, and more with this manually operated stylish typewriter. Score and save space with the Mini Score Board! 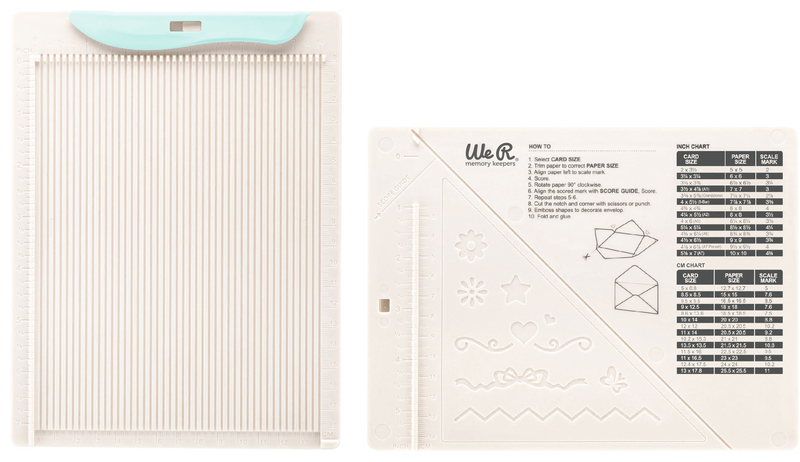 It’s perfect for cardmaking and other small scale projects. Score and create envelopes. 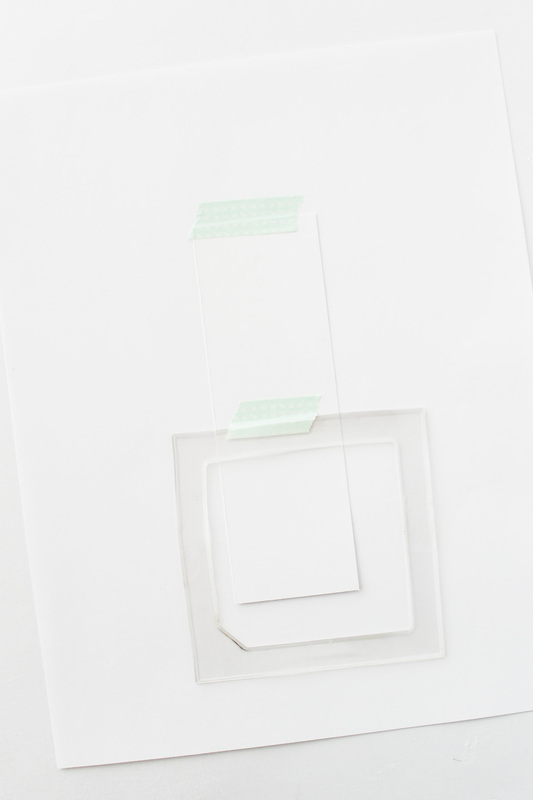 Emboss shapes onto your envelopes for decoration. Instructions for creating envelopes and embossing designs included on the back of the board. 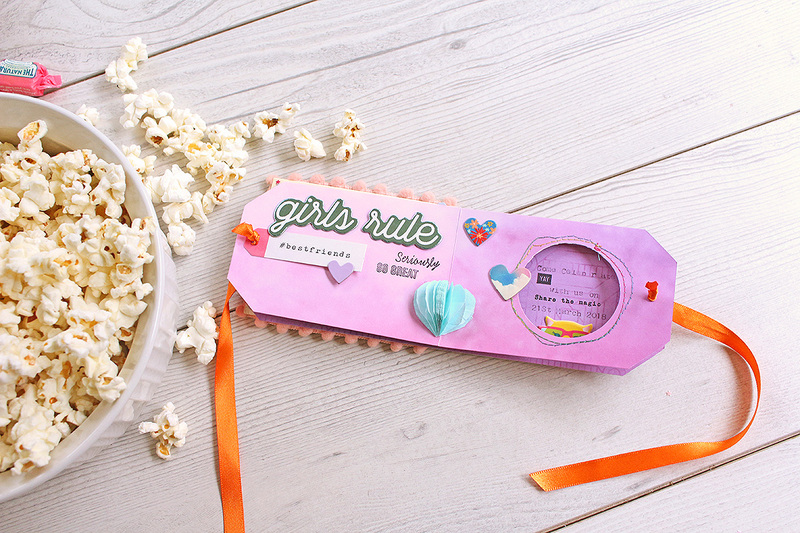 Watch for these fun new tools to land in stores near the end of March or early April! Hello We R friends! Aly Dosdall here again. 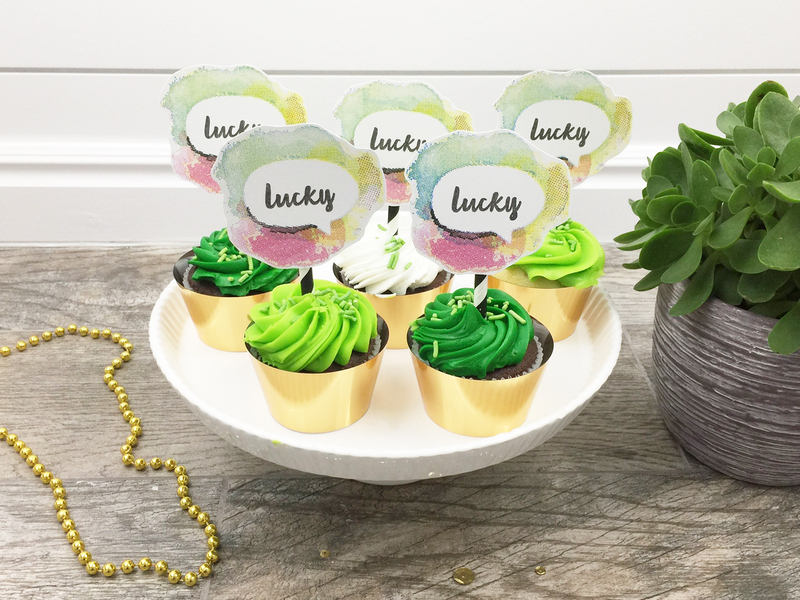 St. Patrick’s Day is coming soon, and at our house it’s a fun day where we celebrate mostly with food! We die our milk green, cook green eggs and ham, and always have a yummy green dessert. This year, I’m thinking it’s going to be cupcakes. 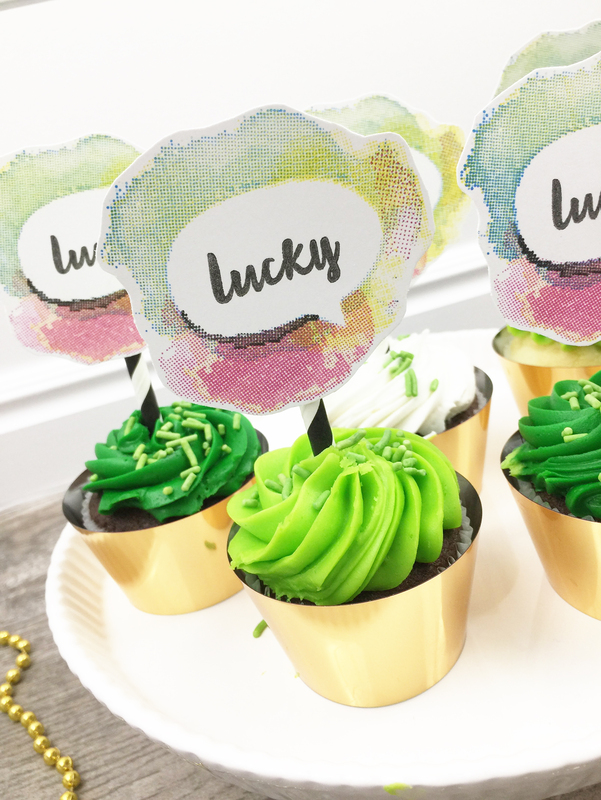 And to dress up those cupcakes, I’ve got a fun idea for some St. Patrick’s Day stamped cupcake toppers featuring the CMYK Stamps + Inks, and the new Acrylic Block Set. 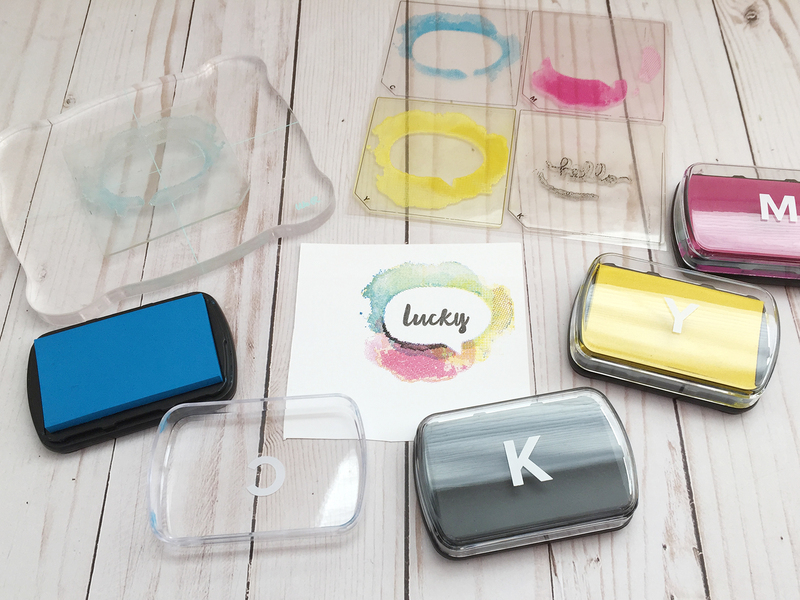 I thought this CMYK layered stamp set would be perfect for the holiday since it includes all the colors of the rainbow. I started by stamping the design from the Hello CMYK Stamp Set. These stamps have a cool pixelated look and work by layering the four basic colors together one on top of the other. I substituted the “hello” sentiment in the middle with the “lucky” sentiment from the Vicki Boutin Moth Dies and Stamps Set. 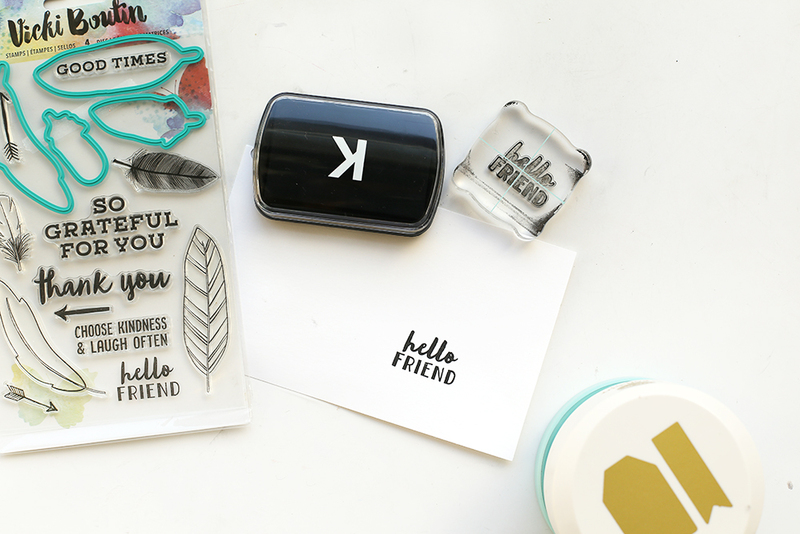 I used some washi tape to cover the “hello” sentiment when inking the black layer of the design, and then removed the tape before stamping so the sentiment didn’t show up. 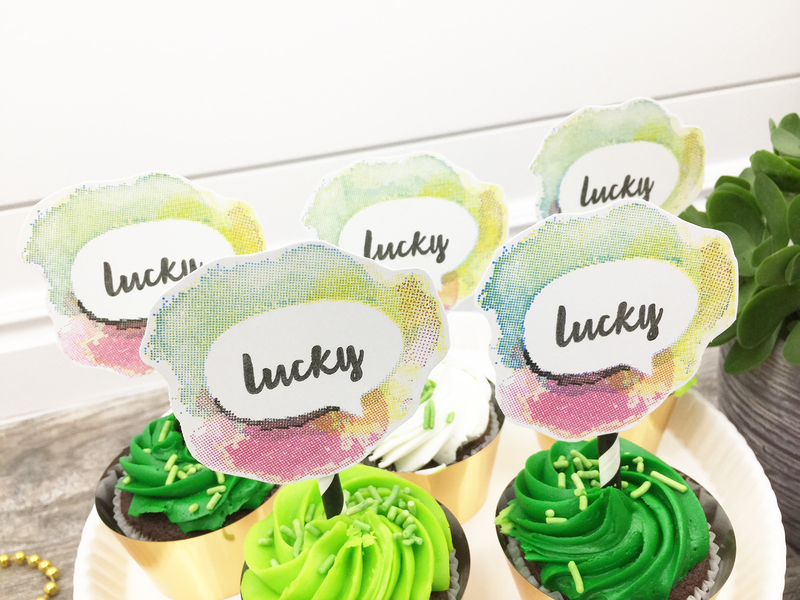 Once I finished stamping the toppers, I cut them out with the new Detail Scissors from the Hand Tools collection, and then hot glued them onto some paper straws with the new USB Power Mini Glue Gun. I love that this glue gun is portable since I don’t need to worry about connecting to an outlet. I simply used my phone charger–awesome! 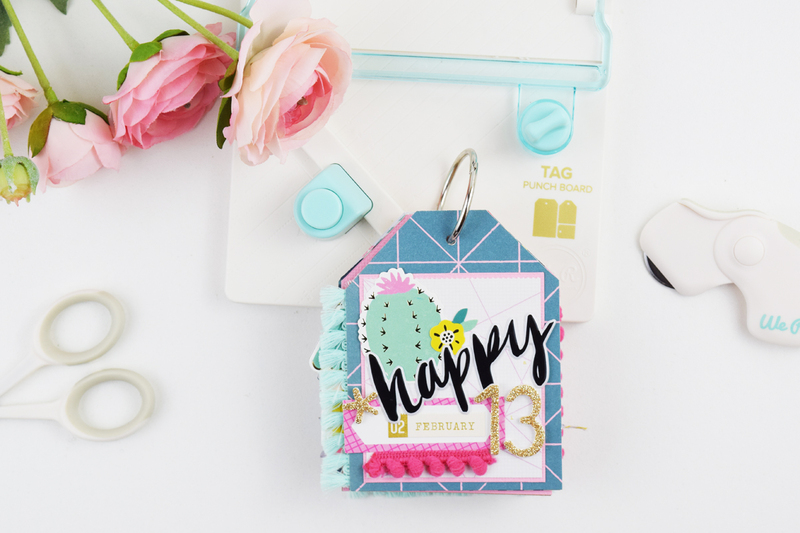 What I love about the CMYK Stamp Sets is that they really are a statement piece on your craft projects. They’re perfect focal points and really don’t need much embellishment. 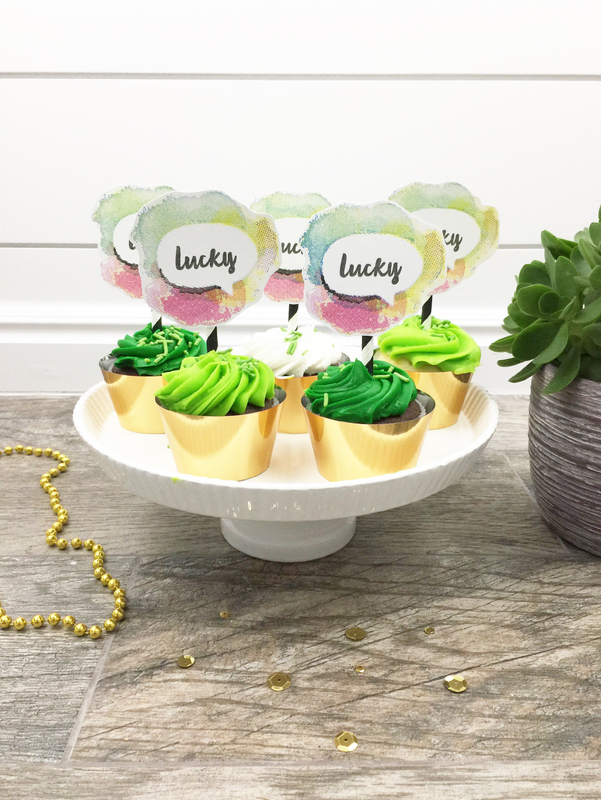 I finished off my cupcakes with some wraps I made out of Bazzill Basics Gold Foil Cardstock with the DIY Party Board. I love how they turned out! Thanks for stopping by–I’ll see you next time. Hello We R Fans! Kimberly Crawford here with a card and matching envelope. When you are stamping, its wonderful to be able to not only create custom-colored images, but also coordinating projects like envelopes. 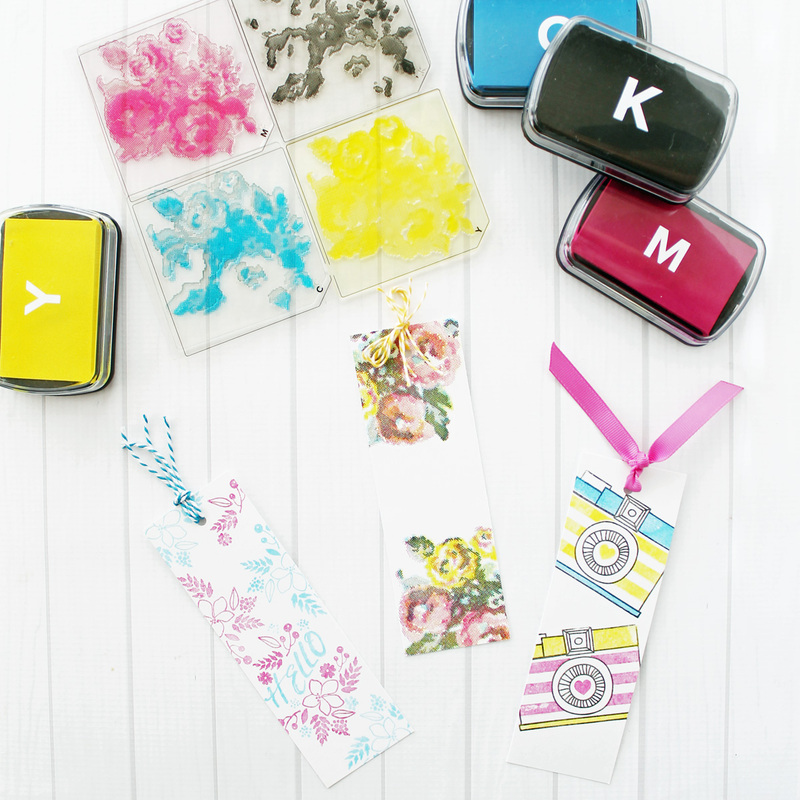 We R Memory Keepers has all the tools to help you create stamped cards with ease. 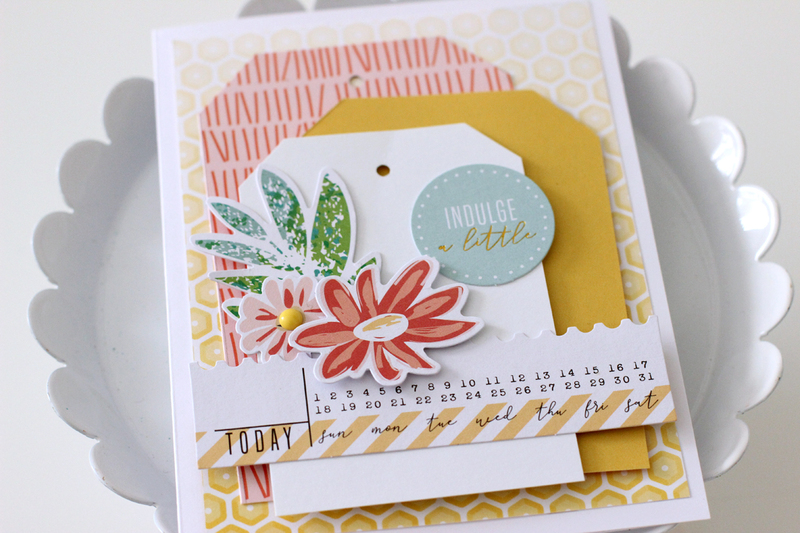 My card began with color inspiration from the Cedar Lane 6×6 Paper Pad. 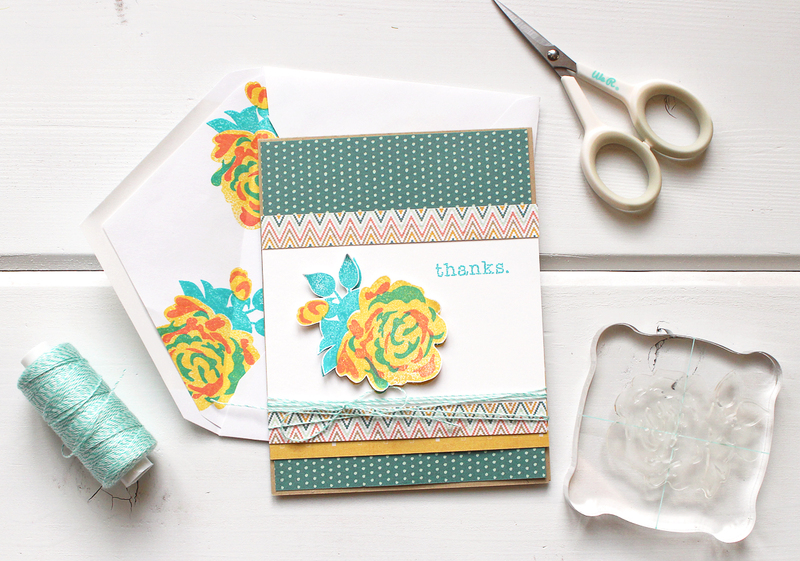 From there, I choose the Rose Layered Stamp set to create my card. The layered stamp sets include a guide image. It is a stamp that assists in perfectly lining up your images. Because of my project, today I did not use that guide image, but it is very handy. The other three images in the set include layers. These layers build up the image and create a lot of depth. You can see how the layers build upon one another. Also notice the acrylic block I am using to stamp my image. I really like the lines on the block. The lines meet in the middle and go all the way across. Having those lines really helps line up your images. While I was stamping my main image for my card, I also decided to stamp a liner for my envelope. I stamped my rose image repeatedly onto white text-weight paper. (so as to not add bulk to my envelope) Using my Envelope Punch Board, I created a simple liner. What a special touch to add, with ease! I trimmed my second stamped rose out and adhered it with foam. This added a ton of depth to my card. The finishing touch to the card was a bit of Stitch Happy Multimedia Baker’s Twine. 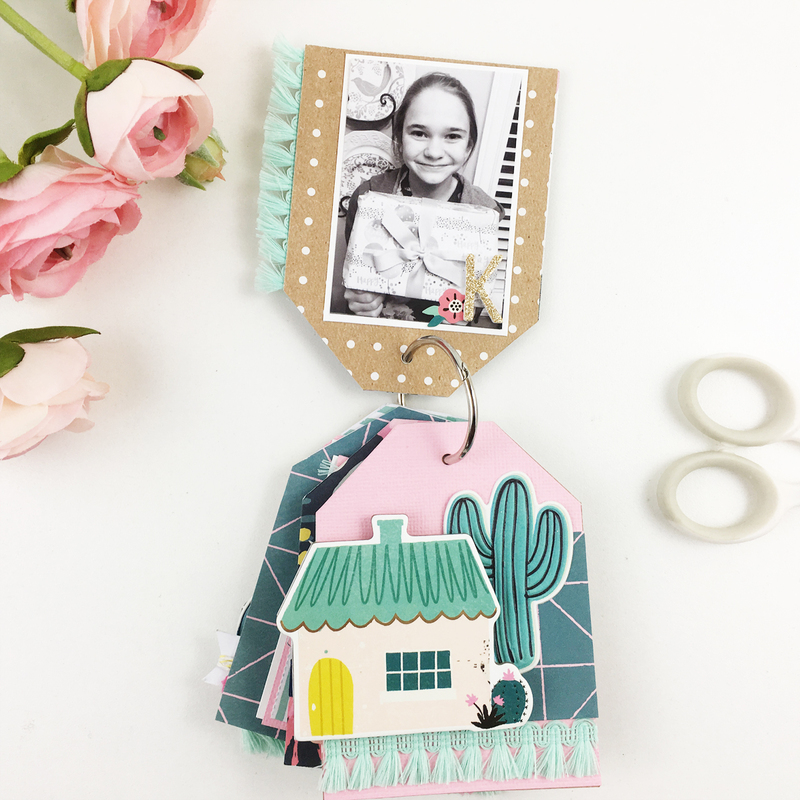 Have you tried Layered Stamps yet? Hello everyone! 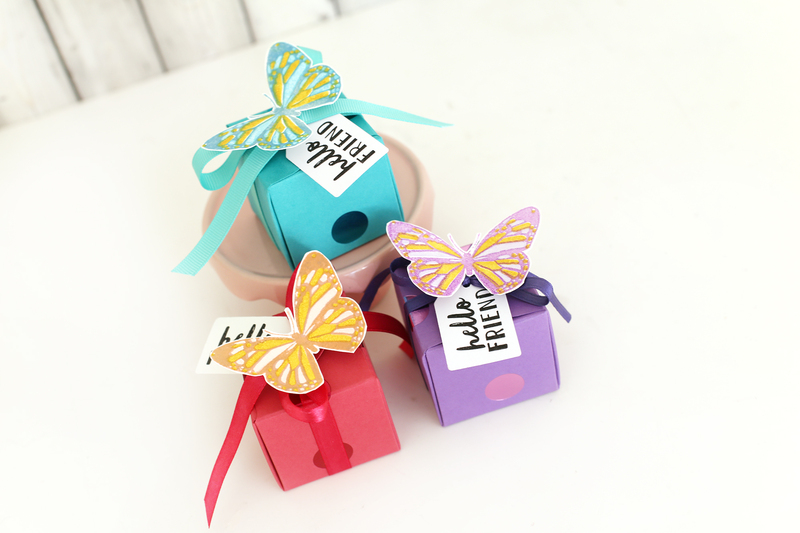 It’s Eva here today bringing you a quick favor box made with the 1,2, 3 Punch Board and the Butterfly Layered Stamp Set. I love to make favor boxes for parties or family events and stamps really make the job easy because you can have all the favors look the same with just a few supplies. For this favor box I used my 1,2, 3 Punch Board to make a Small size box. All the instructions are already on the board so it is super easy! I started with a 6 inch paper to use my 12 x 12 inch paper completely. 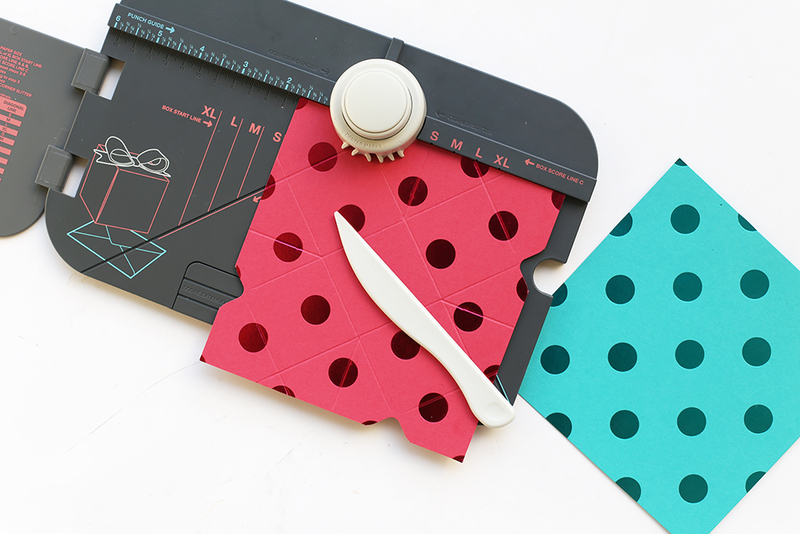 How cute is this polka dot cardstock from Bazzill Paper? There are a lot of colors to choose from! 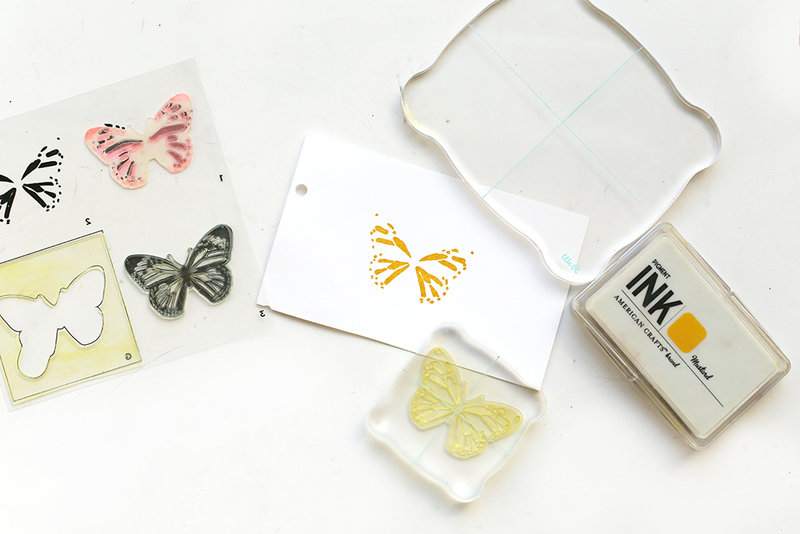 To have a cohesive look I choose the Layered Butterfly Stamp and made them in the same color as my box. 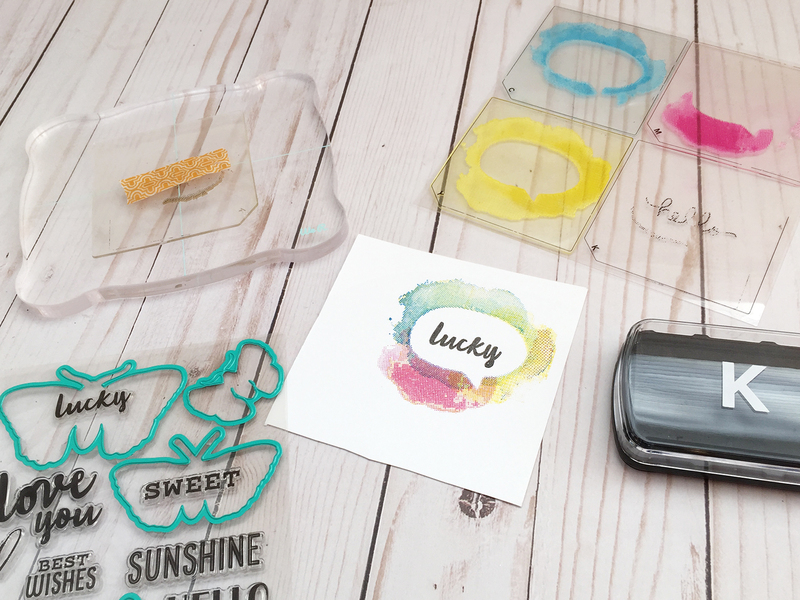 These new Acrylic Blocks come in three different sizes and have guides in the middle so you can align your stamps perfectly! Next, I used my Vicki Boutin stamp set and stamped a sentiment using the black CMYK ink. After that I punched a tag with my Clear Cut Punch. Finally I used my Ribbon Cutter to cut and seal three different ribbons. 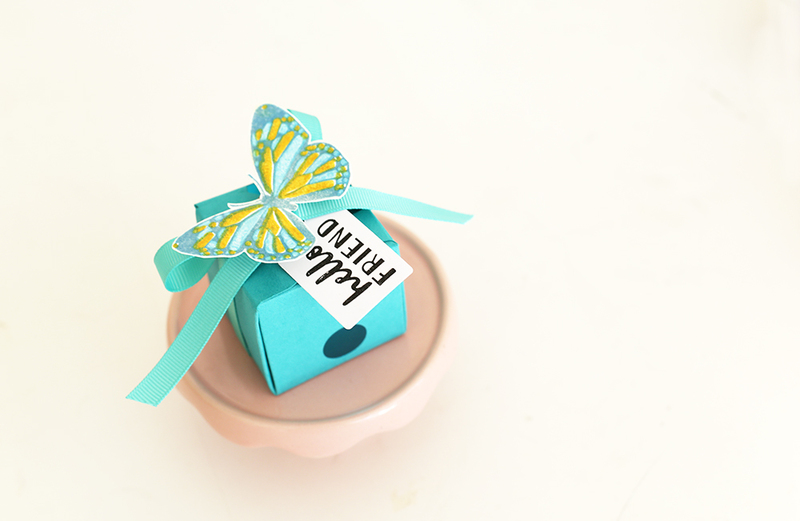 To assemble the box I placed some candies inside and embellished it with the ribbon, tag and butterfly. I love the tone on tone look of these favor boxes! 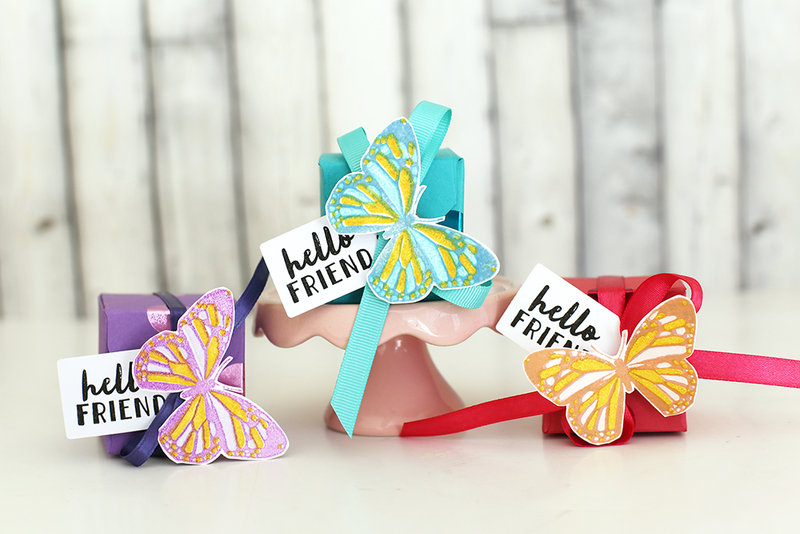 These little favor boxes are super cute and with the help of your favorite Punch Board and some stamps you can make them very quickly. 3 Way Corner Punch Winner! Thanks so much to everyone who entered our 3 Way Corner Punch giveaway! 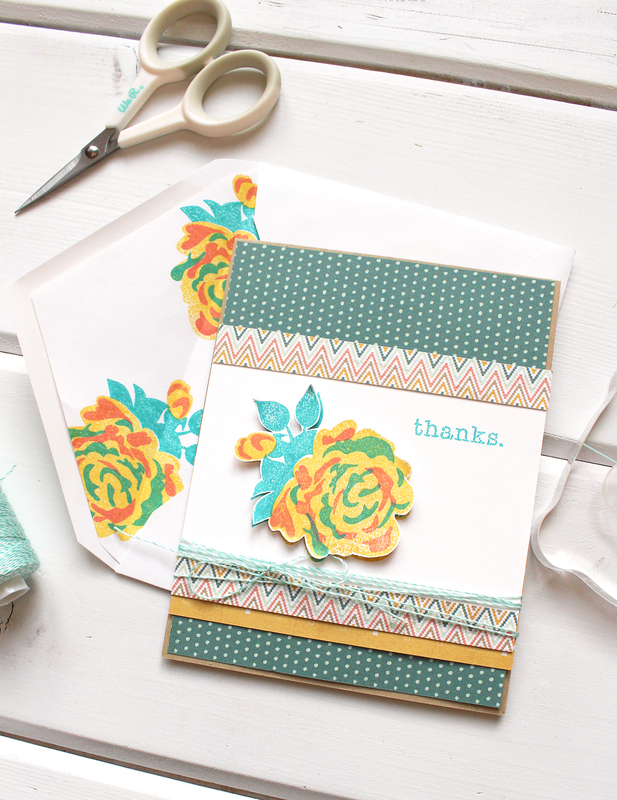 We loved hearing how you would use this crafter’s essential in your projects. I would use the punch on tags folders, cards. so much fun. Congratulations! Please send an email to alyd@americancrafts.com with “Corner Punch Winner” in the subject line. Include your full name and shipping address and we’ll get you your prize asap. Hi there, We R friends, Laura here today. I must admit I am a little bit of a paper hoarder. If I have scraps from projects, I usually save anything that is left over. This year I have been trying to use up some of my stash. 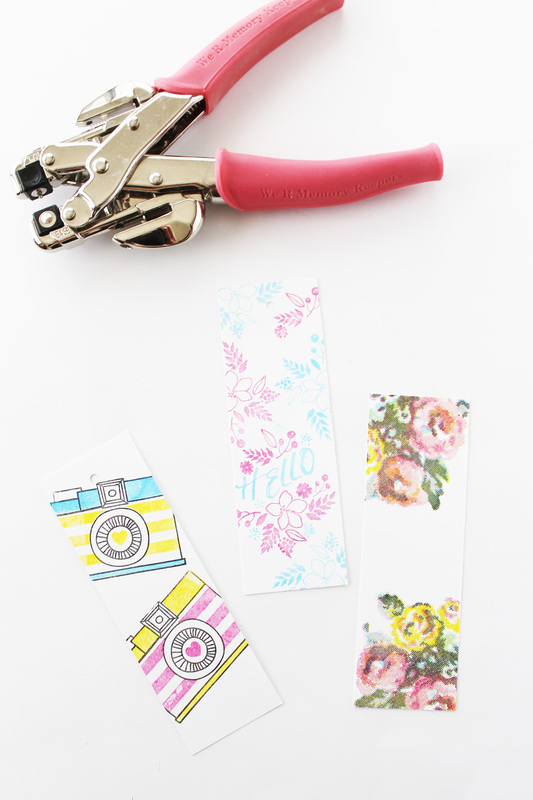 Making stamped bookmarks is the perfect way to use up those smaller pieces of scrap cardstock. My bookmarks are two inches by six inches. 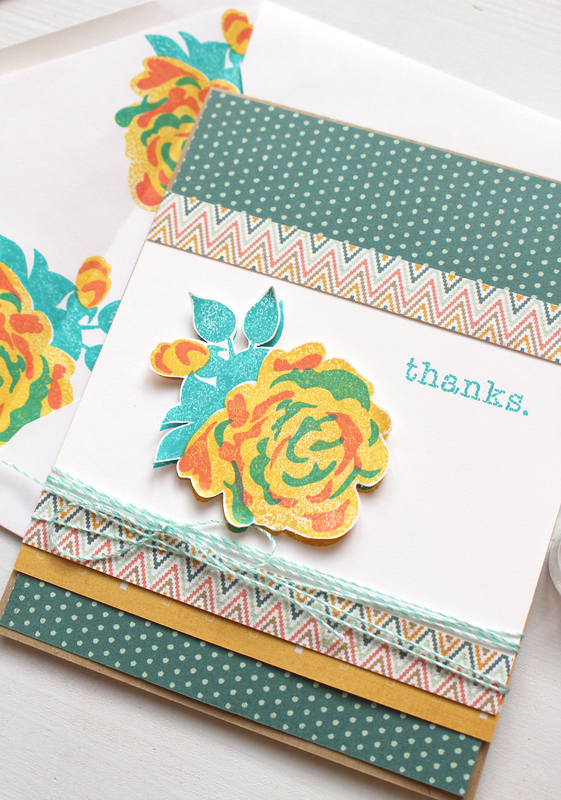 The fun part about using stamps is you can layer them on your project to create an entirely new look. When I am working with stamps that I will be stamping off the edge of my design, I place a piece of scrap paper under my cardstock. 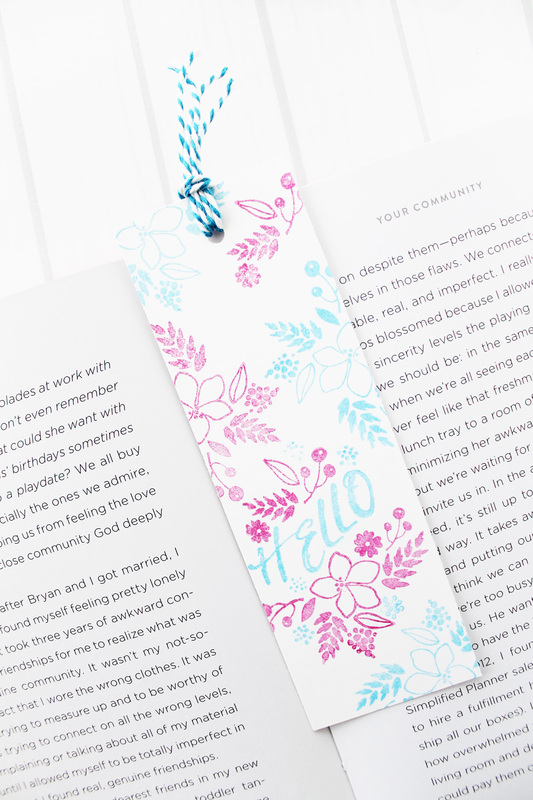 I use washi tape to secure both my bookmark and the alignment frame, so nothing shifts. 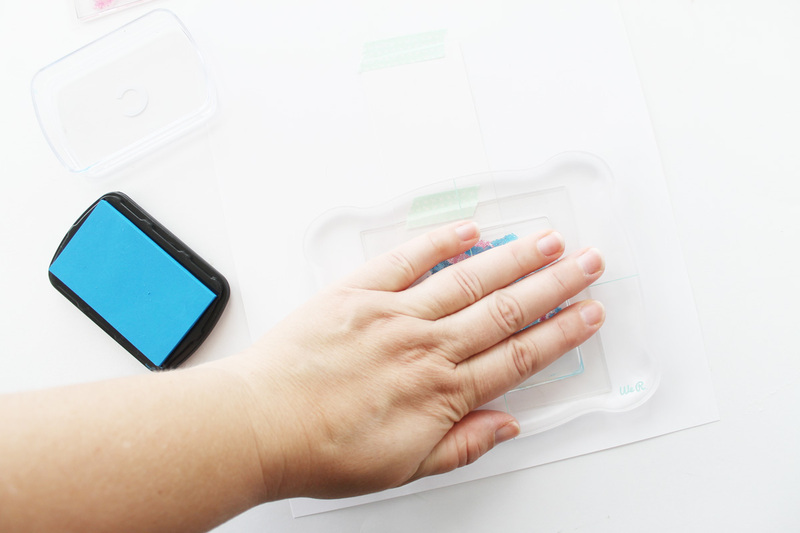 When using the CMYK stamps, start by placing your K stamp on the acrylic block. 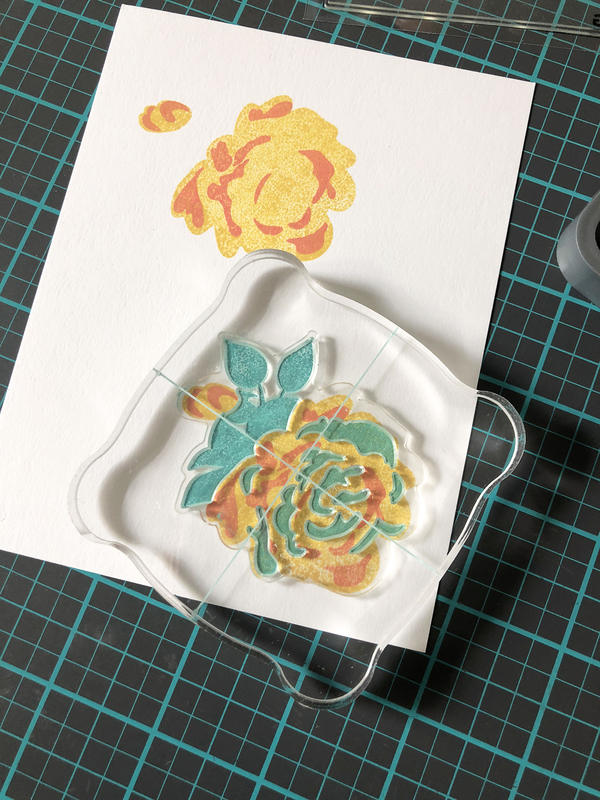 The acrylic block stamping set has three different sizes to make it easy to find one that will work with all your clear acrylic stamps. Apply black ink and place the stamp in the frame. 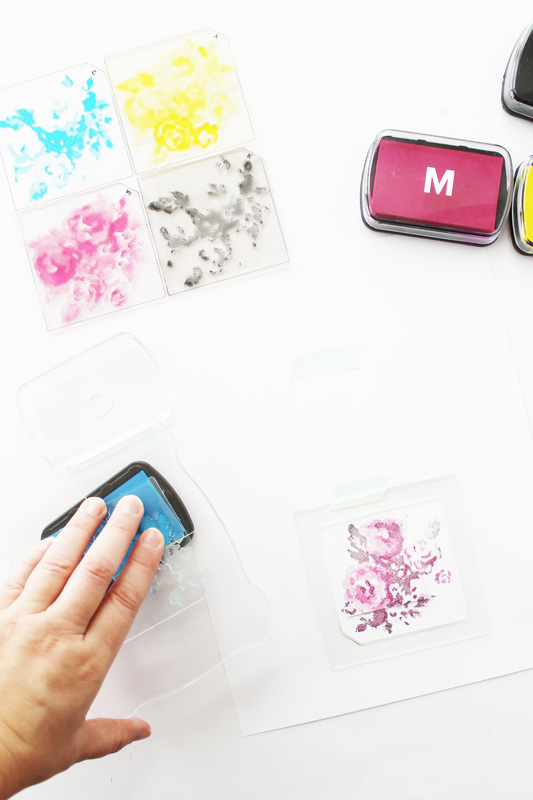 Repeat this process with the M, C, and Y stamps and coordinating inks in that order. I did two roses on my bookmark with each one going off the cardstock a bit. 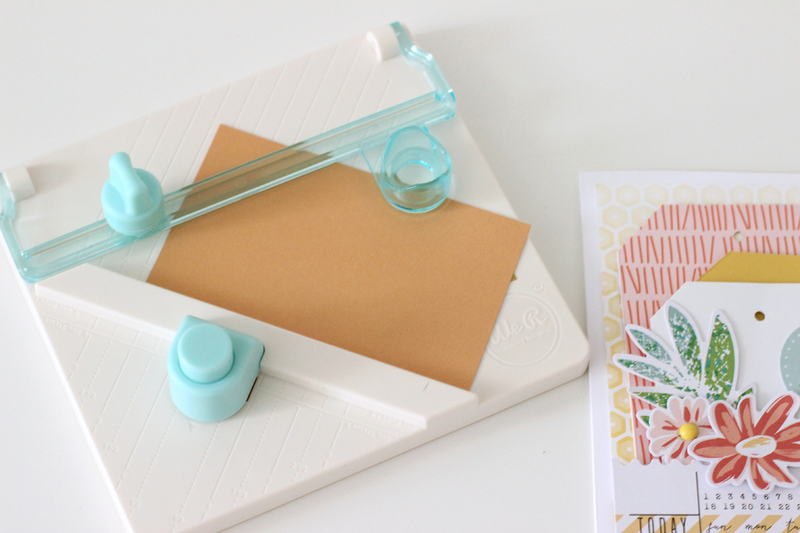 For the layered stamps you follow the same process of first placing your alignment frame on your project. But for these stamps you can completely customize your project by using any color stamp ink you want! For the hello bookmark I used the cyan and magenta ink pads. I started by using the alignment guide to create the layered hello part of the stamp. Then I used the floral stamp to free hand a pattern around it on the rest of the bookmark. On the layered camera stamp, I started by stamping each camera in black. Then, I used different colors to create the inner designs. I stamped the cameras on an angle to make the bookmark a little more interesting. To finish off the bookmarks, use the Crop-A-Dile to punch a hole in the top of the bookmark. Thread ribbon or twine through the hole. 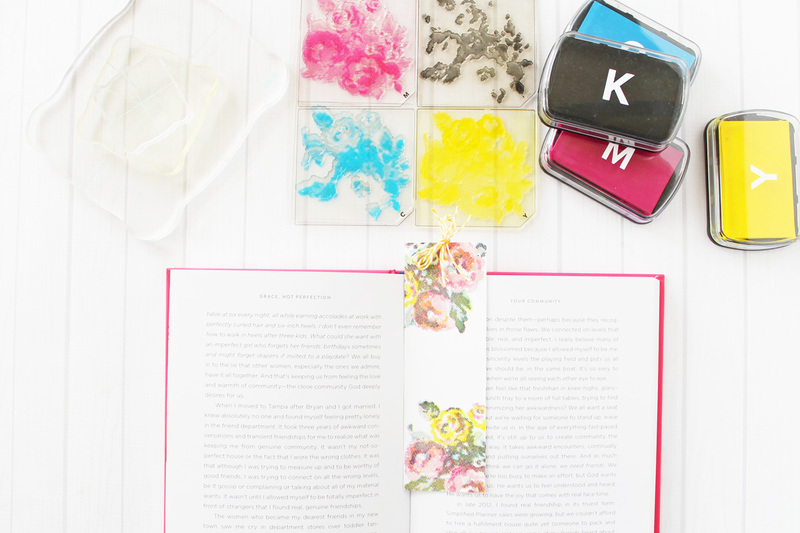 These bookmarks would make a perfect gift for your favorite book lover. 3 Way Corner Punch Giveaway! Happy Friday We R fans! How about we get this weekend off to an awesome start with a giveaway? 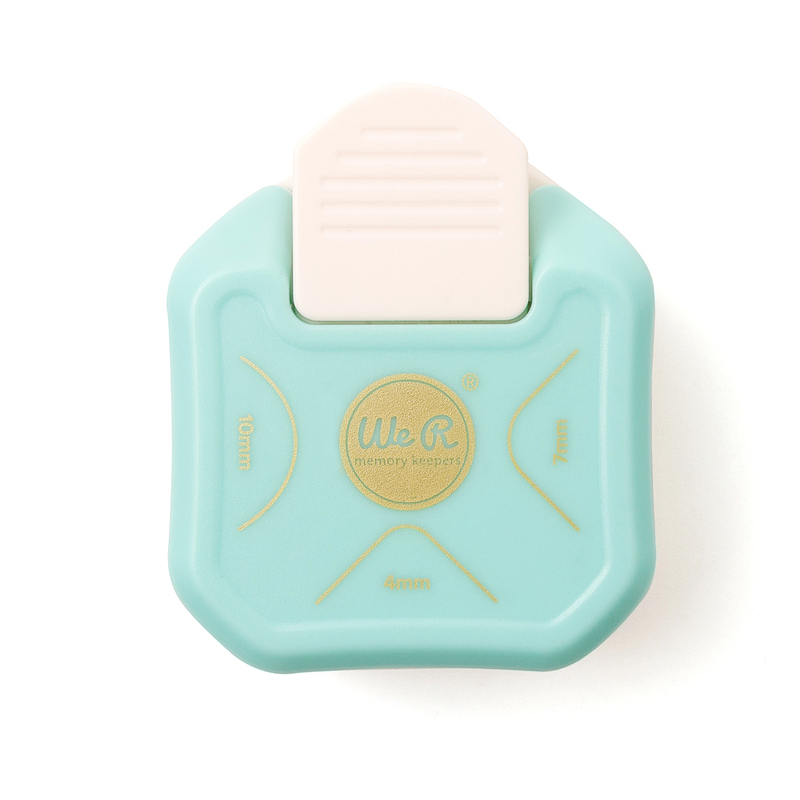 First, we want to share how much we think you’re going to love the new 3 Way Corner Punch. In one tool that retails for just under $10 you get three different size corner rounders–4mm, 7mm, and 10mm. That’s like getting three punches for the price of one! 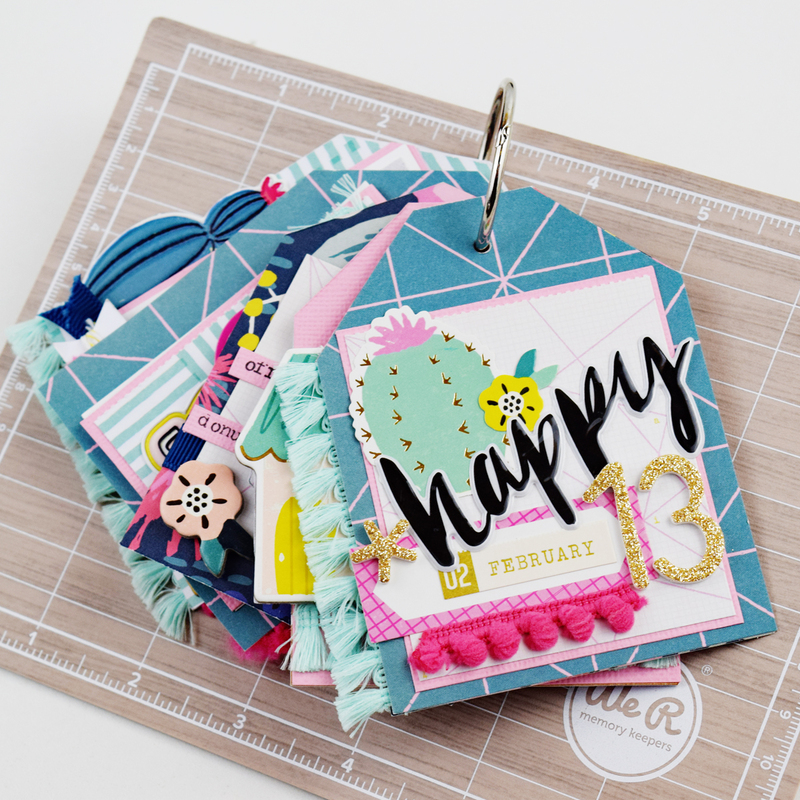 This punch is perfect for cardmaking, Project Life, gift tags, mini albums, scrapbooking and more. It’s sturdy yet easy to operate. They’ll be arriving in stores within the next month! Now for the giveaway!! If you’d like a chance to win a 3 Way Corner Punch, please leave a comment below telling us how you would use this corner punch in your crafting. Comments will remain open until Monday afternoon when we announce a winner. Be sure to check back to see if it’s you! Good luck!